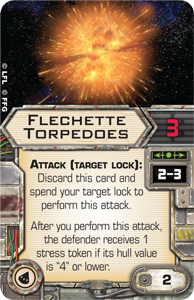 What impact will the new bombers, ordnance, and heavy-hitting starships in X-Wing™ Wave VII make upon the ever-changing metagame? By its nature, the metagame is a moving target. 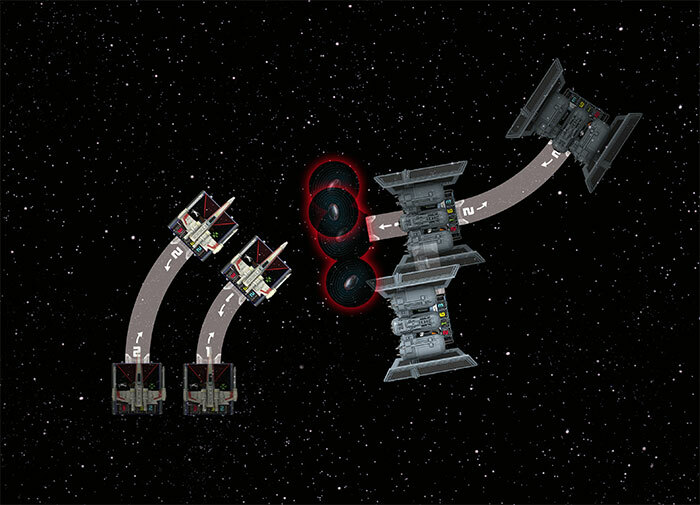 It is constantly shifting as players discover new winning squadrons, then again as other players adapt their squadrons to counter them, and yet against as new ships and upgrades are added to the mix. 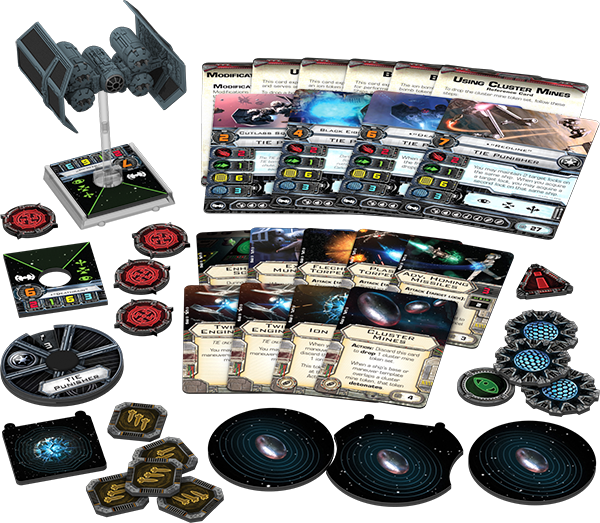 Now, as players look forward to incorporating the new ships and upgrades from Wave VII into their squadrons, we're exploring what sort of squadrons and tactics they might expect to see from the game's factions: Rebel, Imperial, and Scum and Villainy. 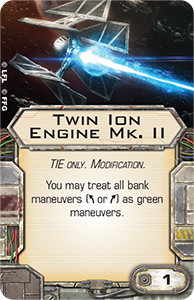 Last week, two-time World Champion Paul Heaver looked at how Rebel squad leaders might incorporate the new K-wing into their plans. 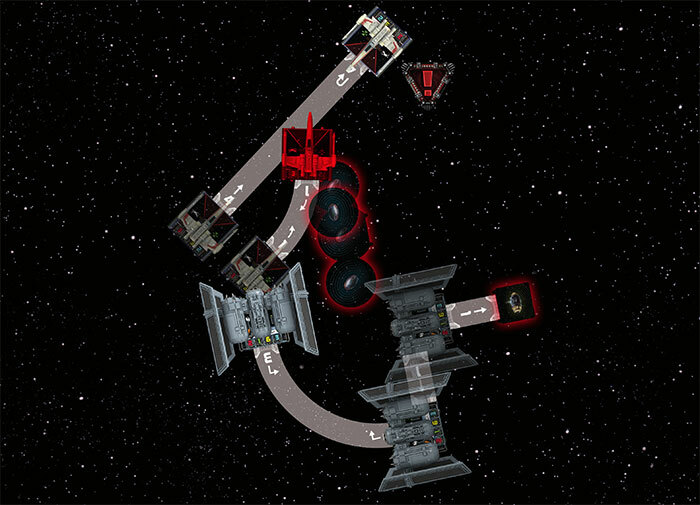 Today, 2012 World Champion Doug Kinney takes a look at the TIE punisher and how it might play a part in future Imperial squadrons. 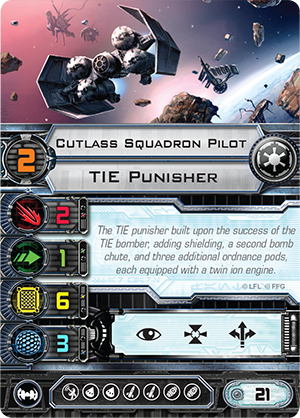 It's natural to compare the new TIE punisher to the TIE bomber, but their squad points costs and maneuver dials differentiate them enough that they don't compete against each other as much as they add flexibility to your squadrons. 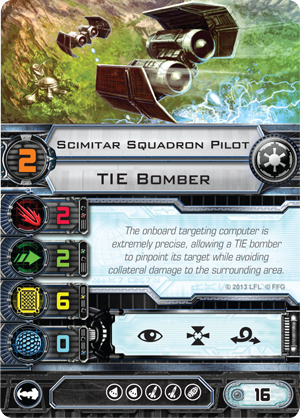 The Cutlass Squadron Pilot costs the fewest squad points of any TIE punisher pilot, coming in at twenty-one points, five more than the cheapest TIE bomber pilot, the Scimitar Squadron Pilot . For those five points, you get a Systems Upgrade slot, an extra bomb slot, and three shields. Most importantly, you get the boost action in your action bar, although at a loss of one agility and the barrel roll action. This changes how the ships fly, as do the differences in their dials. The punisher is generally slower, replacing the bomber's speed "5" Koiogran turn with a speed "4" Koiogran, and it forfeits the TIE bomber's speed "4" straight maneuver. Likewise, its green banks are also slower. The TIE punisher has green banks at speed "1" while the TIE bomber has its green banks at speed "2." Accordingly, the TIE punisher is better suited to approaching your enemy more slowly than the TIE bomber, although with its boost action, it can actually move a little bit faster than the bomber if it needs to. 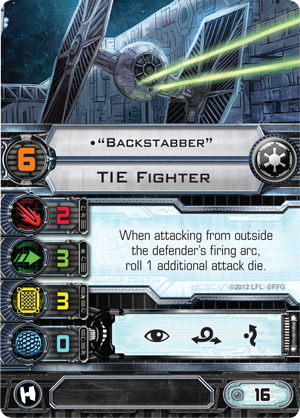 Despite their differences, the TIE punisher still faces one of the biggest conundrums presented by the TIE bomber: how many points do you invest in upgrades to make it viable? Like the TIE bomber, the TIE punisher is primarily a secondary weapons platform, which means you need to add the points you spend on torpedoes, missiles, and bombs to the cost of the ship itself. 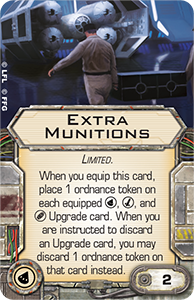 Fortunately, the Extra Munitions upgrade card will help out immensely in this area. 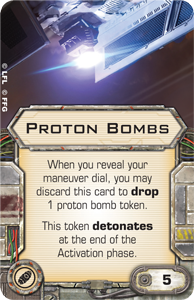 Extra Munitions effectively doubles your payload at the cost of two squad points and one of your torpedo slots. This means that you're getting extra value from every piece of ordnance you add to a punisher with Extra Munitions, so it typically pays to add more than one. 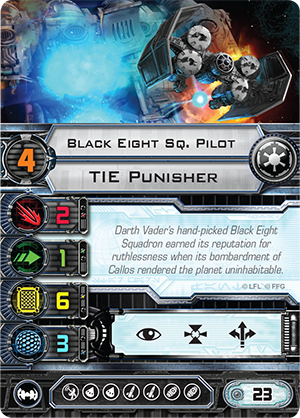 For example, a TIE punisher can equip Extra Munitions and two Proton Bombs , thus effectively gaining twenty points of bombs for just twelve points. 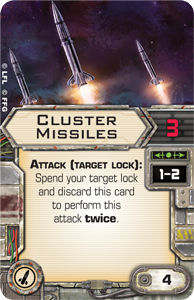 More often, though, I think you will see TIE punishers equipped with a combination of torpedoes, missiles, and bombs to suit each player's customization tastes, since the Extra Munitions card works for all of those upgrades slots. Who Should Pilot Your TIE Punisher? The Cutlass Squadron Pilot has the lowest pilot skill value, at two, and the lowest squad point cost, so it laves you the most points available for ordnance, systems, and modification options. I think one of the more useful systems options for the TIE punisher is going to be Fire-Control System , especially on the Cutlass Squadron Pilot. 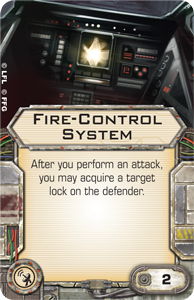 With Fire-Control System, your punisher can attack a target in the first round of combat, acquire a free target lock, and then focus in the next round before firing Cluster Missiles or an Advanced Proton Torpedoes to really punish its target. Additionally, the Fire-Control System removes one of the problems normally associated with low pilot skill ordnance ships, in that they usually require two rounds to use their ordnance effectively against higher pilot skill ships. Also, because Fire-Control System will allow your Cutlass Squadron Pilot to maintain a target lock on its target, it can use munitions during multiple consecutive rounds, a feat that was previously very difficult to pull off. The other non-unique pilot, the Black Eight Squadron Pilot weighs in at pilot skill value of four, which makes it more effective against lower pilot skill ships than the Cutlass Squadron Pilot. Because it maneuvers after the ships with the lowest pilot skill values, the Black Eight Squadron Pilot will be able to acquire a target lock on the first round of combat. Thus, the Black Eight Squadron Pilot will be able to fire its ordnance at targets earlier than the Cutlass Squadron Pilot. This likely translates to one extra round of firing ordnance, and that one extra round could make all the difference as you try to destroy a ship before it fires, thus keeping your ships on the table longer. The ubiquity of ships featuring a pilot skill value of three or less means that the pilot skill value of four is a sweet spot for an ordnance platform. The Black Eight Squadron Pilot's pilot skill value of four is also particularly meaningful in Epic Play, where the CR90 corvette also attacks at pilot skill four. Having one or more Black Eight Squadron Pilots on your side will mean that even if the CR90 destroys them, they'll still be able to attack with the simultaneous fire rule, meaning they can deal damage to the CR90 from shots that a Cutlass Squadron Pilot would not have been able to take. "Deathrain" comes in at a pilot skill value of six and with a very fun ability. 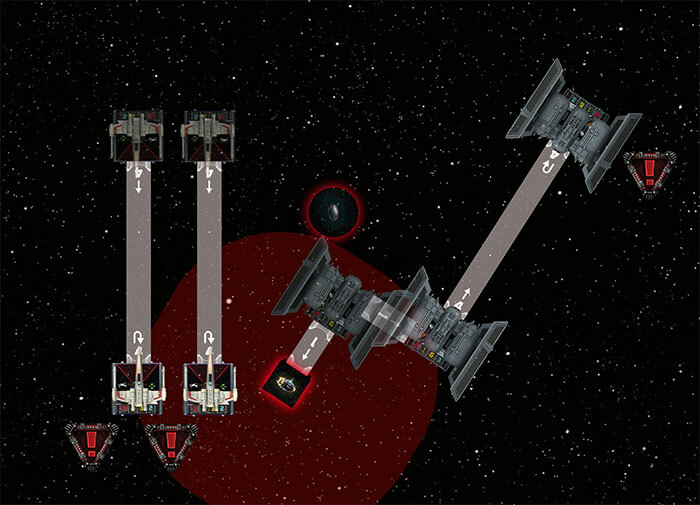 "Deathrain" can use the front guides of the ship to drop a bomb, then perform a free barrel roll action. This permits some interesting shenanigans, especially if he equips Extra Munitions to be able to deploy bombs as many as four rounds in a row. One round he can drop his Cluster Mines out of his front guides during his perform action step, then barrel roll out of its way. 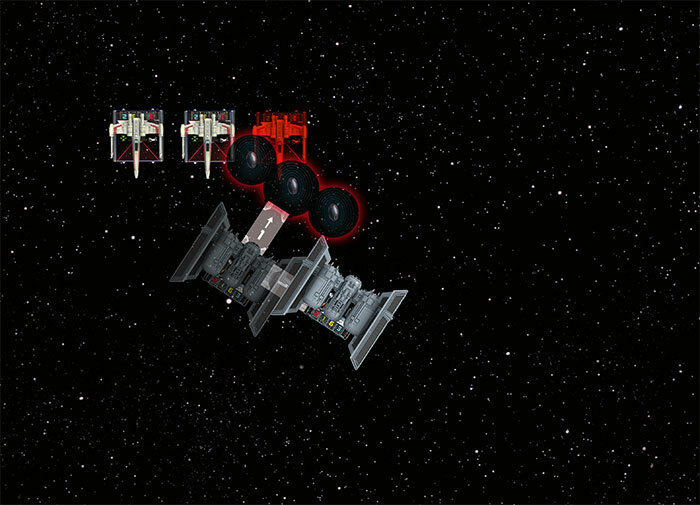 "Deathrain" flies forward and deploys his Cluster Mines, immediately exploding two of them on an injured X-wing to destroy it. Then next round, he can drop his Seismic Charges , again using his front guides, then perform a forward barrel roll action and a speed "4" Koiogran turn to get out of the blast zone. 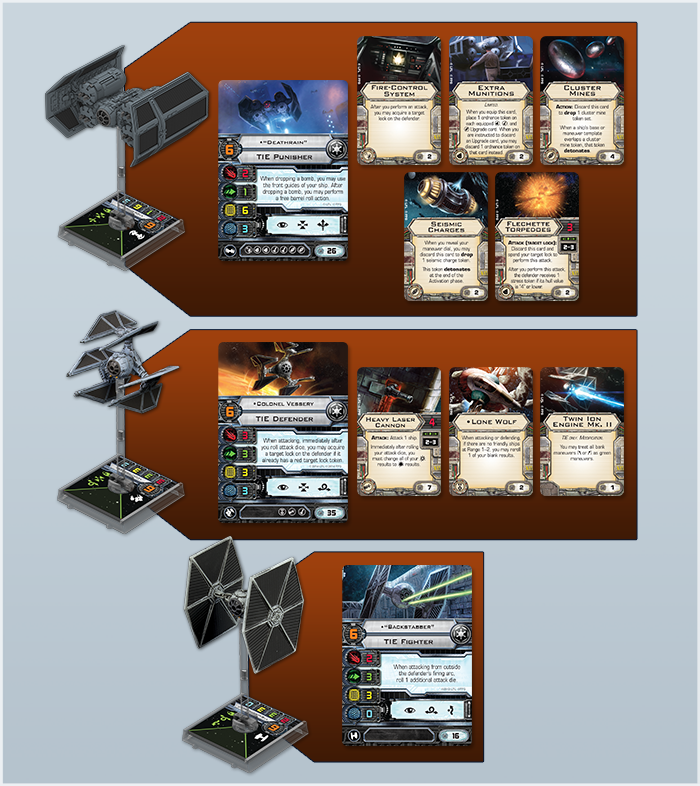 In the following round, "Deathrain" catches both remaining X-wing pilots with his Seismic Charges, even as his Koiogran-turn sets him up for another approach. Next, he can perform a green maneuver and drop his second Cluster Mines out of his front guides, before performing yet another barrel roll action. In his fourth round of bombing, he can drop his last Seismic Charges. Even if he can't catch any enemies in its blast radius, deploying his Seismic Charges allows him to perform another barrel roll action before he reveals his maneuver dial, and that lends him the flexibility he needs to go wherever is best, depending on the board position. 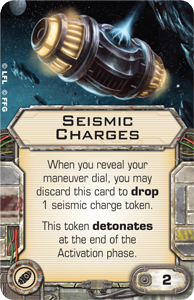 After one of the two remaining X-wing pilots triggers two Cluster Mines and explodes into a ball of fire, "Deathrain" drops his last remaining Seismic Charges in order to barrel roll before revealing a speed "3" turn that allows him to catch the final X-wing in his sights. Finally, if "Deathrain" is equipped with Fire-Control System, he can be firing missiles or torpedoes the entire time as well. I personally can’t wait to try this out on the table. 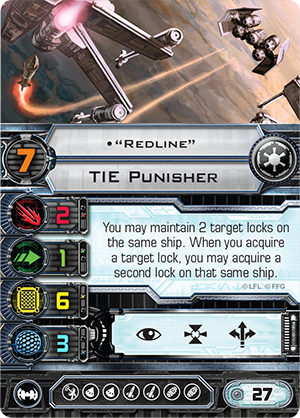 The final TIE punisher pilot is "Redline," who has a pilot skill value of seven and a unique pilot ability that allows him to maintain two target locks on the same target, which will mean that the ordnance he uses should generally be more accurate and deal more damage. 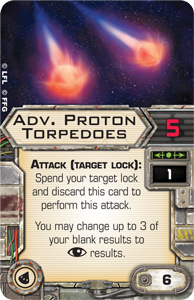 Many of the missiles and torpedoes available require discarding the target lock in order to use them, which means the attack dice are often unmodified. 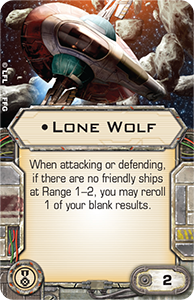 Because "Redline" can spend his target lock and use it, too, his modified attack dice should result in more favorable results for his ordnance. How should we Imperials go about squad building with the new TIE punisher? Here, "Deathrain" controls the middle of the board, while Vessery and "Backstabber" flank from either side. 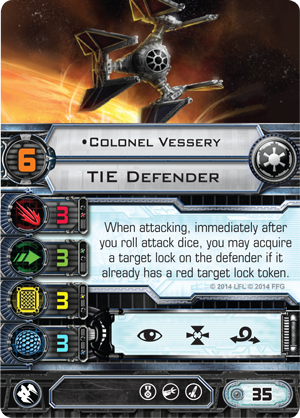 All three have a pilot skill value of six, meaning "Deathrain" can attack first to gain a target lock, allowing Colonel Vessery to use his ability to its fullest. Alternatively, you could forgo the secondary weapons options altogether and just go for raw resilience. This squadron is full of forty-four hit points of meanness, designed to run straight at your opponent and wear down his ships, while weathering their attacks with shields and reinforced hull. 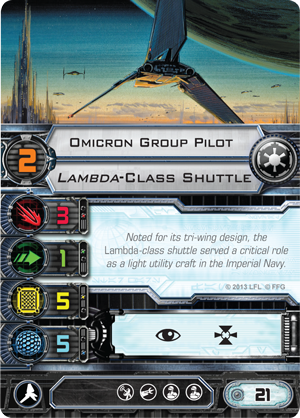 Importantly, this list features better maneuvering options than a list of four Omicron Group Pilots and a Scimitar Squadron Pilot, but the fact that the Cutlass Squadron Pilot and the Omicron Group Pilot both cost you twenty-one squad points means that you can interchange them as you please. Plus, because all these ships activate at pilot skill two, you can maneuver them in whichever order is most beneficial to you during the activation phase. Finally, I think one of the places the TIE punisher will really shine is in Epic Play. Since the huge ships have zero base agility, secondary weapons tend to do more damage, thanks to the fact they negate the ranged defense bonuses that primary weapons provide. 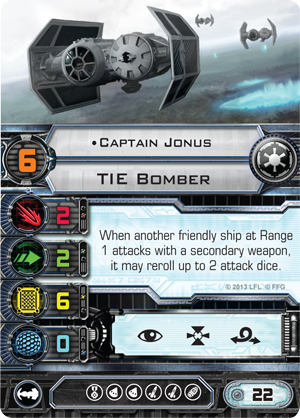 A group of TIE punishers with Captain Jonus could be a serious threat to any huge ship on the board. The TIE punisher is a ship that begins with a conundrum about upgrade options but that goes on to give you all kinds of choices. 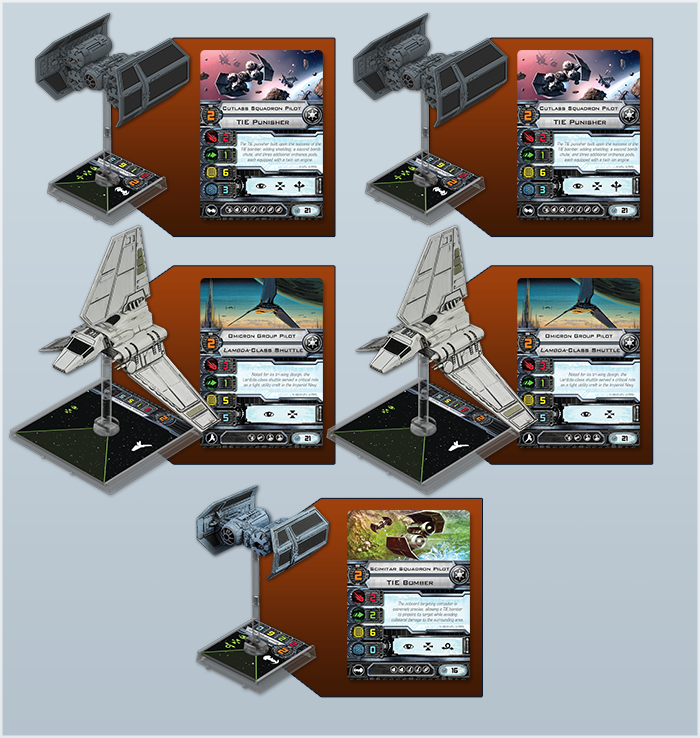 Whichever format you choose to use it in, the TIE punisher will definitely add more flavor and more fun to your Imperial squads. 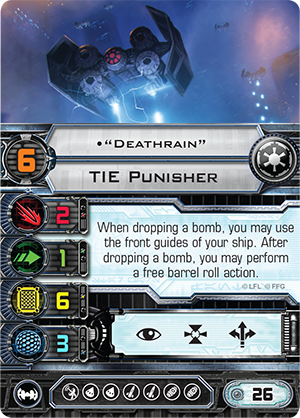 As Doug reminds us, the TIE punisher is a big ship with plenty of potential for big, dirty, explosive tricks, and it's just as well suited to the massive battles of Epic Play as it is to controlling the battlefield in Standard Play. 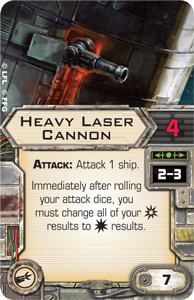 How will the Rebellion and the galaxy's Scum respond to the appearance of the TIE punisher and the increased impact of ordnance? 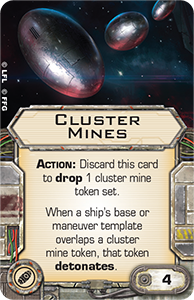 We'll take a look at part of that answer next week when developer Alex Davy guides us through some of the Scum faction's more likely future squadrons and strategies!